The electromagnetic levitation system controls the magnetic field generated by an electromagnet to levitate a small magnet in midair. The small magnet levitates in the air indefinitely without any disturbance. The vertical position of the levitating magnet is measured using a linear Hall effect sensor and the current in the electromagnet is controlled using a microcontroller. The system has three push buttons to adjust the vertical position of the levitating magnet and to apply a sinusoidal, square or sawtooth reference signal. 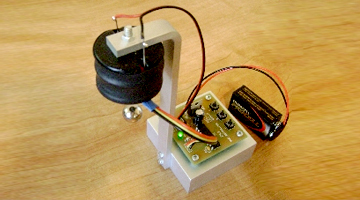 The magnetic levitation system is available as a kit or fully assembled unit. The system works with both the 1/2" N42 sphere magnet and 1/2" x 1/8" N42 disc magnet (or three disc magnets stuck together). This is a great science fair project for students. It is recommended for ages 12 and up.